Regular readers of this blog will remember that before the writer’s strike, I did a weekly rundown of episodes of NBC’s The Office. You can imagine my delight when I rang up my TIVO last night and saw that The Office was back. 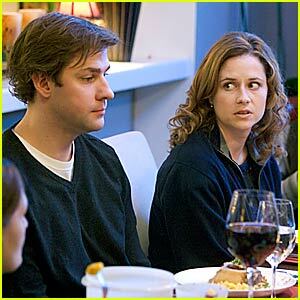 The Dinner Party was The Office’s version of Who’s Afraid of Virginia Woolf? with Jan and Michael of course in the George and Martha roles. I think this was one of the best episodes they’ve ever done… which it should have been after such a hiatus. I was hoping for more of Andy and Angela, but I guess we’ll get that later this season. One of the things that has made the American version of The Office excel has been its focus on the absurdity of our work-mates, not just our workplace. I suppose you could read something into the difference between Brits and Americans in this… The British version of The Office was about the plight of normal people trying to exist under the thumb of an authoritarian dumbass. It’s a comedy very much much born from a tradition of monarchy and a class system. David Brent was a Twit… maybe not an Upper Class Twit, but a twit none the less. Michael Scott, in contrast, is a character that could only be born from an egalitarian society… a LAZY and CLUELESS egalitarian society. David Brent rose to his position on the strength of his preening and pomposity. Michael Scott got where he is because no one was paying attention, or had the guts to enact some quality control. What makes the American version of The Office so great is that it taps into the sense that work throws us all into an environment that forces us to interact with a bunch of losers, psychos and miscreants that we would never dream of knowing otherwise. The stupidity of the boss is beside the point. The stupidity of the boss is taken for granted. The stupidity of the guy in the next cubicle over is what breaks your soul down on a daily basis. The British version never got to an episode as nuanced as the Dinner Party. Of course, they never got a chance to. I also love the subtle details. For instance, the Scott condo. The black-framed picture frames from Target. The aspirational purchase of a 10 inch plasma tv. I remember when I first saw Office Space, thinking: the apartment complex those guys lived in is EXACTLY the sort of apartment complex my entire generation has lived in at one time or another in our 20s. It’s the same with the Scott condo. Probably a townhouse condo. Sold as a step up from a single floor condo, sold for around $200k until recently… but still a step down from, and a hopeful stepping stone to, a McMansion. How many people of a certain age are living in just such a condo as they watch the episode? Kudos to the Office. And welcome back.